Calder is a Nord warrior from Windhelm. 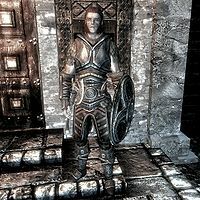 Once you have purchased the home in Windhelm, Hjerim, and attained the rank of thane of Windhelm, Calder is appointed your housecarl and will automatically appear in Hjerim. Calder wears a set of steel armor a pair of steel Nordic gauntlets, and a pair of steel cuffed boots. He is equipped with a steel war axe and a steel shield. He will wait in the home until he is ordered to follow you. If he is dismissed he will return to Hjerim and resume waiting. He is also a potential candidate for marriage. He may attack you for no apparent reason. ? Gaining a bounty in a hold, then paying it off, seems to work. Calder will address you as a stranger (i.e. "You lost?") whenever you enter Hjerim and he is not a current follower. This page was last modified on 24 November 2018, at 11:55.